Thursday, 5th July. The FBM KLCI continue to chart new historical high yesterday as local fund continue to accumulate blue chips stocks across the board. Other news to follow. "- Most Asia markets ended higher Wednesday as sharp overnight gains for gold and crude-oil prices spurred resource stocks, although Hong Kong and Chinese shares fell on profit-taking after recent advances and ahead of key global economic events. Australia’s S&P/ASX 200 Index AU:XJO +1.09% , which declined on Tuesday to defy a broad regional rally, jumped 1.1%, while Japan’s Nikkei Stock AverageJP:100000018 +0.41% and South Korea’s Kospi KR:SEU +0.35% added 0.4% each. Taiwan’s Taiex inched up 0.1%. Hong Kong’s Hang Seng Index HK:HSI -0.13% and China’s Shanghai CompositeCN:000001 -0.08% each slipped 0.1%." Stock index and index futures continue to surge amid positive sentiments on local stock market and steadier economy outlook. Regional market were also recover promisingly amid news on monetary easing on Europe and China. At close, the FBM KLCI rose about 6 points to 1,613.75 while index futures for July contract went up about 4.50 points to 1,617. Both instrument rose to historical high level. Technically, market strong accumulation or Bullish momentum have let the index futures breached the major resistance level or previous high level above 1,615. The Bulls done it with enthusiasm as open interest manage to pick up about 3,449 lots more compare to previous Tuesday while volume was recorded lower yesterday. The increased open interest could mean that there is still genuine accumulation activities at the new high. 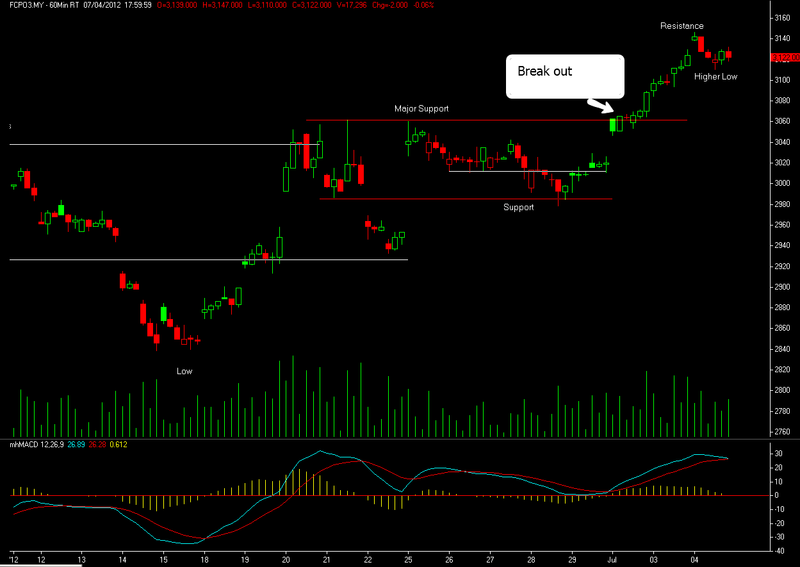 In other technical perspective, yesterday new high was also consider as an upside break out. Medium term technical outlook remain positive and market should be continue to go up with some mild retracement along the way. CPO futures manage to rose up to 3,147, a level unseen since 30th May but succumb to short term profit taking right after the opening bell. Most market participant prefer to book their profit as soon as the market open yesterday as it gap up due to overnight Soy oil recovery to 53.09 cents per pound on Tuesday. CME will resume it normal trading session by today 5th July, 1am Malaysia time. With the dollar index rising trend (last seen traded at 81.915 or up 0.13% on 6.13PM +8GMT), upside on commodities market is likely capped at the moment. Technically, the benchmark Sept positive momentum remain intact even though there is a mild retracement occur throughout yesterday session. If you always or only trade with the trend, watch out for Bullish formation such as higher low or higher high candle on smaller time frame to get a possible Long trade set up. Else for counter trend traders, they could spot a failure swing movement by looking at Bearish divergence, especially if there is no follow thru Buy when the market gap up too high. But for the mean time, strong Bullish formation is presence based on the evidence of higher low candle formation on hourly chart shown above. 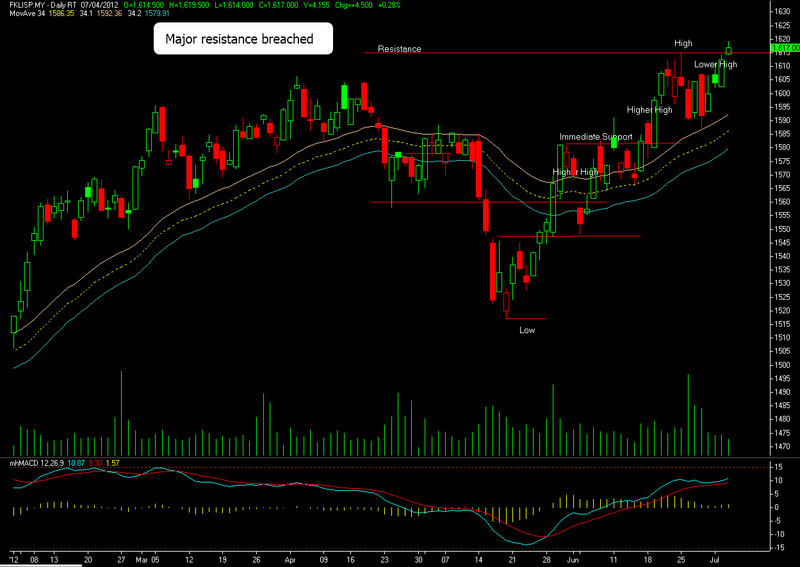 For today, support is located around 3,105 while resistance is pegged at 3,142.